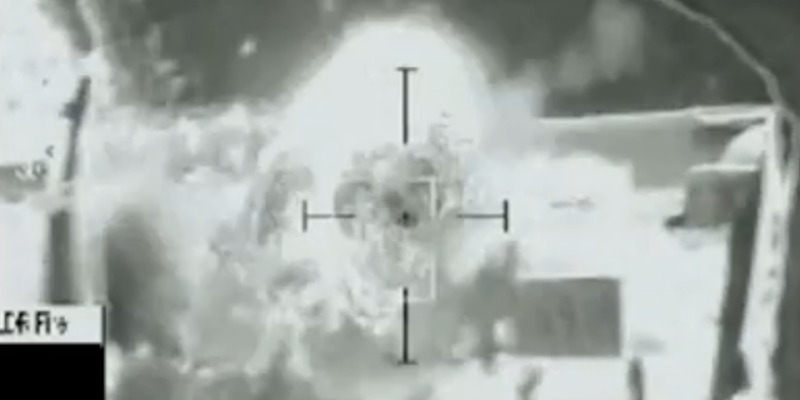 Resolute Support HeadquartersA screenshot from a video showing the moment the Afghan Air Force’s first laser-guided airstrike made contact with its target, March 22, 2018. The Afghan Air Force (AAF) conducted its first-ever laser-guided airstrike on a Taliban compound in Farah Province, western Afghanistan on March 22, 2018. The strike is a milestone for the AAF, as it is trying to wean itself off of its dependence on air support from the NATO-led Coalition. The strike is also part of an offensive that NATO commanders have said would be “a very long winter” for the Taliban, in part because of the new capabilities of the AAF. The Afghan Air Force (AAF) has conducted its first airstrike with laser-guided bombs, according to a press release from NATO’s Operation Resolute Support mission. The munition, a GBU-58 250lb bomb, was dropped from an AAF Embraer A-29 Super Tucano and struck a Taliban compound in Afghanistan’s Farah Province. The strike, an important milestone for the AAF and the Afghan National Security Forces, was conducted by AAF pilots from Kabul Air Wing’s Kandahar A-29 detachment. NATO said that the strike shows that the Afghans are making progress in slowly weaning off of their dependence on Coalition airpower to help them in firefights. General John Nicholson, a Resolute Support commander, said in October 2017 that “a tidal wave of Afghan airpower is on the horizon.”Recent offensives have seen the AAF conduct close air support for Afghan and coalition forces, often aided by Afghani drones. “Key pieces that you’re seeing is that the Afghan Air Force itself, one of the more lethal organisations they have, and one that we’re looking to triple in size by 2023, is conducting significantly more air operations in direct support of the ANDSF on the battlefield, to the tune of 500 more sorties this year than they did the year before,” US Air Force Brigadier General Lance Bunch said in a December 2017 press release. The AAF is currently made up of 8,000 servicemen, supporting around 129 aircraft. Afghan President Ashraf Ghani wants to increase that to 11,000 servicemen, and triple the size of the air fleet currently in service.